If you are one of the bloggers who publishes articles too frequently then publishing directly from desktop in a few clicks may be easier than publishing from the web interface (although Web interface has evolved into lot better now a days and most of the desktop blogging client lacks even basic features, except Windows Live Writer (but we can’t change Operating System just for Live writer )). On Ubuntu or other Linux distributions such as Linux Mint, Fedora, PCLinuxOS, OpenSuse etc, There are few desktop blogging softwares are available for blogging that supports Blogger, Live Journal, wordpress, wordpress (self hosted or called as Movable Type), Tumblr, Posterous etc but none of them are even little closer to Live Writer. 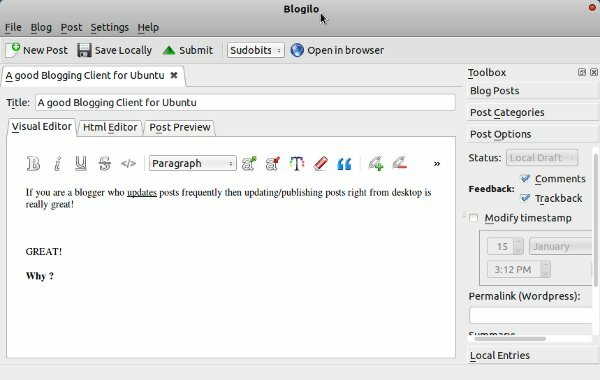 In this post you will learn about Two great software – one a KDE blogging client called as Blogilo and the other one is ScribeFire, a plugin for Firefox, Chrome and Opera. 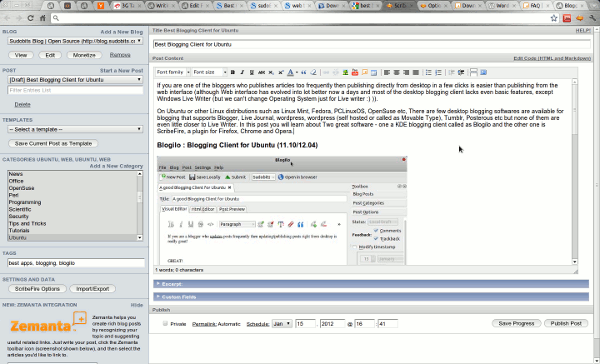 Blogilo is a KDE blogging client, it works well with Gnome 3 or other Desktops. It is the most advanced blogging software in Ubuntu. it is very easy to use and supports a lot of blogging platform. 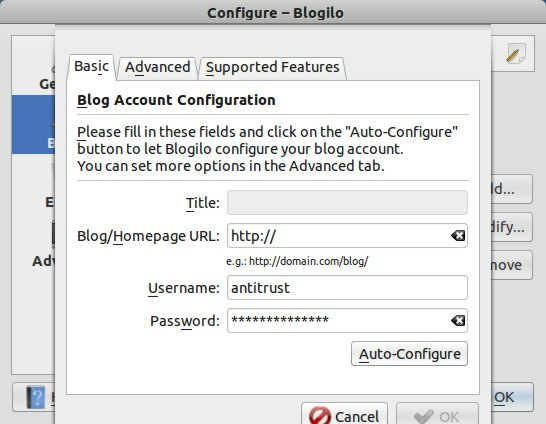 #2 : Then specify the URL (address of your blog), enter the login details (username and password) and click on Auto-Configure button. #3 : Click on New Post icon, write post and when you’re done – hit the submit button. That’s All, check out the new entry in your blog! ScribeFire is a very simple and easy to use blogging tool – available as a plugin for all modern Web Browsers such as Firefox, Chrome, Opera etc. ScribeFire has a lot of cool features – including the most basic features – tagging, categories (creating new categories is also supported), Excerpt, Custom Fields, WYSIWYG editor etc. Some advanced features – including Zamanta Integration (which will allow you to get relevant meta data – such as images from Wikipedia, Flickr etc, for the posts; and it’s free), Markdown support etc. Initially it was available – only for Firefox but from its vs 4.0, it’s available for all popular browsers, and so it is platform independent! I get the same error eruaran gets with blogger/blogspot. I have yet to find a blog client that works with Gnome 3/Gnome Shell and Blogger. What’s out there for native Gnome are still stuck on Gnome 2. I recomend “Drivel Journal Editor” for Ubuntu 11.10. At least in Drivel there is no annoying errors during Publishing posts. But Drivel lacks a lots of Fucntionality. If your need is to only write 10-20 lines without formatting then Drivel is the best.